The controversial Daily Show segment that left Washington Redskins fans feeling "defamed" and "in tears" aired on Comedy Central last night. If you've been wondering how on Earth these brave defenders of the offensive Redskins team name and logo could end up feeling so victimized, well, here are your answers. 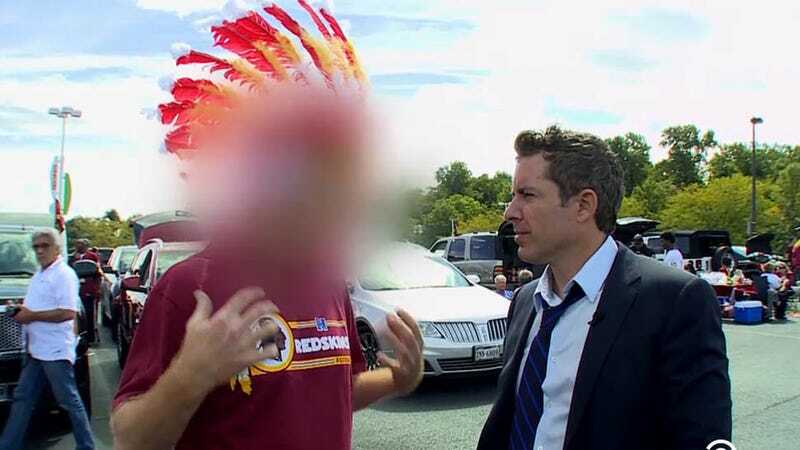 Trouble began last week when a small group of Redskins fans complained to the Washington Post that they felt taken advantage of when Jason Jones, in a yet-to-be-aired Daily Show segment, surprised them with a confrontation with several Native American activists who are currently protesting the Redskins team name. "This goes way beyond mocking. Poking fun is one thing, but that's not what happened. It was disingenuous. The Native Americans accused me of things that were so wrong. I felt in danger. I didn't consent to that. I am going to be defamed," participant and Redskins fan Kelli O'Dell told the Washington Post. Because of the Redskins fans' complaints, the segment was being both maligned and celebrated before it even aired. Which is probably why, last night, Daily Show host Jon Stewart introduced it with a solid defense. "Some of the people who participated in the piece — they didn't enjoy the experience, something that happens a lot less than you would think" he said. "But we take the complaints seriously. We generally do not want people who participate in the show to have a bad experience. We work very hard to find real people who have real beliefs and want to express those beliefs on television. And we work hard to make sure that the gist of those beliefs are represented accurately — albeit sometimes comedically — on our program." "If we find out that someone in a piece was intentionally mislead or if their comments were intentionally misrepresented, we do not air that piece. We would not air that piece," he continued. "So that being said, I hope you enjoy the following piece." It's too bad that the Redskins fans feel like they're not in control of their representation and like their image is being used in offensive ways. Who can imagine what that would feel like?